In this skit on The Little mermaid, Arial, our little mermaid (Not to be confused with the font) has her eye set on Prince Error (an unfortunate name that he couldn’t really help) who is a human. 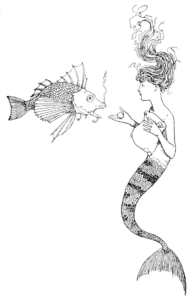 The only way she can get married to him and have lots of little merchildren is to become human. Since she is just sixteen, she just doesn’t have a checking account or even a credit card so she gives the evil sea queen, ”Umbrella” her voice as payment. But the story ends well – she gets her voice back. Although she kind of sounds like Pinky Pie, nobody minds, really. As long as she doesn’t sing. Ever!! And they live happily ever after. Read more about best selling skit writers Lois and Kelly Corcoran. Read some more material of Lois and Kelly’s – Start Wreck – skit on Star Trek. Cast: 2F, 4M and 1N. When there’s danger….he’ll come. When there’s a damsel in distress….he’ll come. When there’s life threatening circumstances….he’ll be there to save the day. All you need to do to call him is to give the super signal in this superhero skit. But one day, two policeman get to reminiscing about old times and working with The Masked Avenger. The fact that they’re in the same vicinity as the super signal seems too good to be true. So….they press it. What happens next? Type: Short one act comedy play, skit. Level of difficulty: 6/10 – a funny skit for three actors. Characterization.